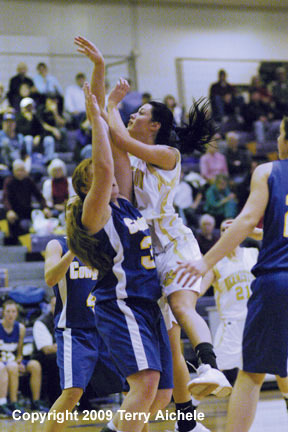 Kaitlyn Duncan, a 5'6" senior from Crook County drives to the basket being guarded by the 6'1" Mary Teresa Barnett. HERMISTON - The Crook County Cowgirls (IMC 9-3) defeated the Hermiston Lady Bulldogs IMC 6-6) 69 to 55 in a foul filled game. The game was played on Saturday, February 14, 2009. The teams committed in the neighborhood of fifty fouls. A foul occurred on the average of about one every 30 seconds of game time. Hermiston led early in the first period on the shooting skills and freethrows of Maloree Moss, Hannah Whitsett, Kathryn Barnitz and mary Teresa Barnett. Three minutes in the Cowgirls closed in and a shot by Sami Verity tied it up at eight. A trey by Crook County's Sarah Crofcheck gave the Cowgirls a clear four point lead at 15-11. Kaitlyn Duncan hit a freethrow with a half second to play to give the Cowgirls a 16 to 11 lead. 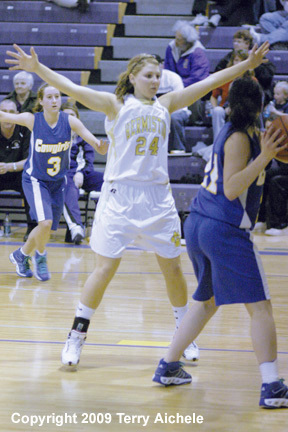 The Cowgirls started off the second period outscoring Hermiston nine to three in the first three minutes of play. The Dawgs then held Cowgirls at 25 for almost a whole minute while scoring three points to close to within eight. This middle third of the period became a real foul fest with both teams racking up the calls and neither team dominating the foul line. Hermiston clawed back into the game closing to being down five at halftime. Crook County led at the buzzer, 34 to 29. Crook County dominated play in the third period. The Cowgirls had a 14 point lead two minutes into the period, 45-31. Hermiston could close in a few points here or there but the Cowgirls continued to dominate in the closing minutes of the period. The Cowgirls led at the end of three 51-38. The fourth period had Crook County continuing their strong play as they basically cruised to the 69-55 win. Both teams had strong players. For Crook County the leaders included Paige Buswell, Lindsey Dunn, Danni Severance, Sami Verity, Sarah Crofcheck, Kersey Wilcox, Kaitlyn Duncan, and TaNeshia Fulton. Top players for Hermiston included Maloree Moss, Hannah Whitsett, Kathryn Barnitz, Mary Shae Hays, Jade Crossley, and Marie Pedro. 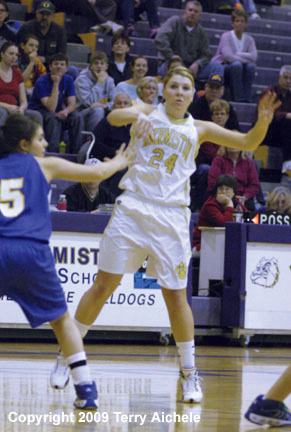 Hermiston will host Madras on Tuesday, February 17, 2009 at 7 p.m. Then the Dawgs travel to Pendleton for a 7 p.m. on Friday, February 20, 2009. Currently Hermiston is tied with Pendleton and Bend with identical 6-6 IMC records. Summit leads the IMC with an 11-1 record. In second place is Crook County with a 9-3 record. LEFT - Hermiston's Marie Pedro passes the ball across the court. 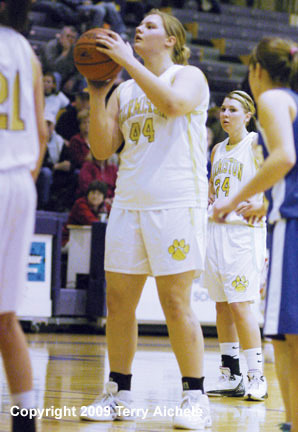 RIGHT - Mary Teresa Barnett of Hermiston at the freethrow line. LEFT and RIGHT - Marie Pedro of the Dawgs works her way along the baseline and puts up a shot. 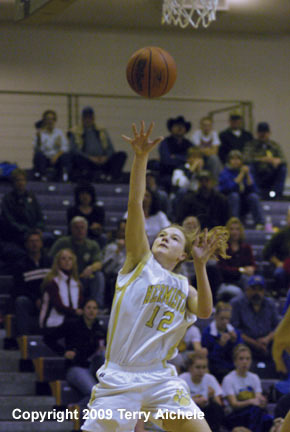 LEFT - Maloree Moss of Hermiston takes a shot. 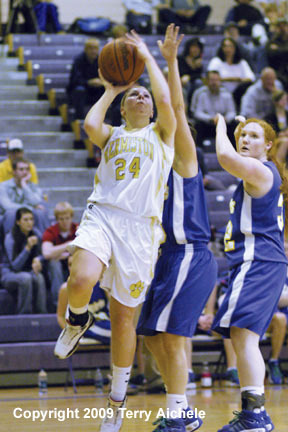 RIGHT - Mary Shae Hays of Hermiston drives to the basket. LEFT - Hermiston's Maloree Moss works the perimeter. 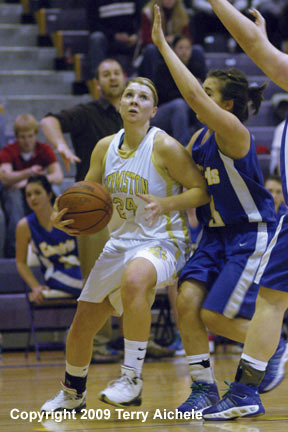 RIGHT - Maloree Moss of Hermsiton drives to the basket. LEFT - Mary Shae Hays of Hermiston makes a move around Danni Severance of Crook County. 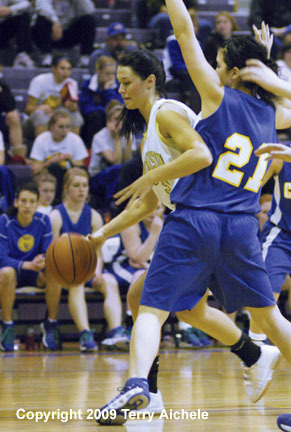 RIGHT - Marie Pedro of Hermiston stretches to try and cut off passing opportunities for a Crook County player.